It's been a long time since I posted any off-site highlights. How are things with you all? The news at my house is that, like the Duke and Duchess of Cambridge, we too are expecting. My eldest kiddo is a little worried that the new baby will "cry all the time," but he's offered to donate one of the doll cribs so that the baby will have somewhere to sleep. 1. CPH has published a book on learning about the Christian saints, and they are offering a free companion resource designed specifically for home school families. Mom, What Are We To Do With the Saints? 2. This list of hymns to use while teaching or "praying through" The Book of Concord looks useful. "Often we are told to 'cherish' time, particularly at pivotal moments such as a wedding, the birth of a child, or the waning of a dear one's days. But what does that mean? How do we 'cherish' time? Do we say over and over in our head, 'Cherish, cherish, cherish, cherish'? Do we consciously try to pay more attention to what is going on than we normally would? Do we tell those around us to stop talking to us, needing us, and giving us things to do so that we can just bask in the moment at hand?" MORE. 4. Lately I've seen several thought-provoking posts about how modern attitudes toward technology are sometimes based on a misunderstanding of what it means to be human. These posts have relevance to the pro-live/pro-choice debate, as well, because they involve our mental model of what makes life valuable. "There’s nothing wrong with intelligence, of course. . . . But intelligence is hardly the 'most precious and powerful resource' in existence—not even close. That place of honor belongs to love. And I find it striking how rarely transhumanists speak about love or how to enhance our capacity to express it—except, perhaps, in the most carnal sense." "...[T]he common habit of treating robots as people—however much it seems like a joke or a shorthand or a metaphor—could erode our already diminished sense of the human person as uniquely special." "But here is the problem: Worries about Artificial Intelligence reflect a diminished view of human beings and the human mind." 5. This is worth showing your kids. 10+ Reasons Not to Trust Photos You See on Social Media by Viktorija G.
6. 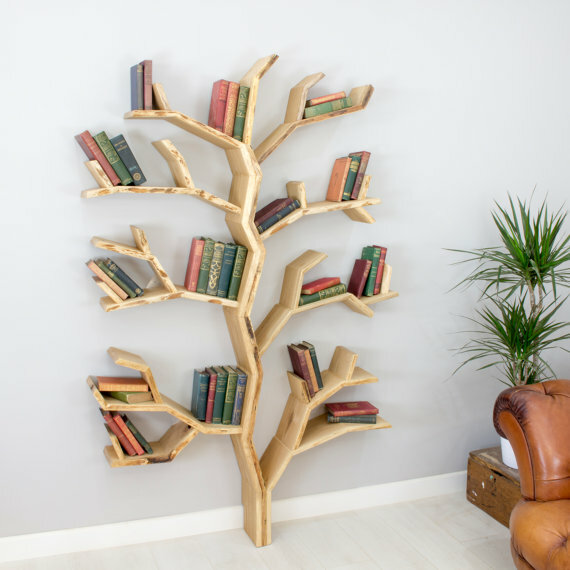 And this is just really cool: a bookshelf you could order for your very own. (The Etsy shop in question). 6. Plus, I was on Issues, Etc. this week. You can listen-in here.